Presumptive Democrat presidential candidate Hillary Clinton has been in the news a lot this week, following an offhand remark by political strategist Karl Rove that she might have brain damage owing to a really, really convenient concussion she suffered which prevented her scheduled testimony at a Congressional hearing on the Benghazi debacle. Rove has since walked back his comment, saying that Hillary Clinton may not be brain damaged, and that he was misled by unsubstantiated reports that she spends a lot of time muttering the word "Rutabaga" and laughing uncontrollably while she snaps her teeth at fart bubbles in the bathtub. But questions persist, not in the least because Bill Clinton has now leaped into the fray to "clarify" matters - giving information completely at odds with what was previously the official story of damage to his wife's noggin. According to the State Department, Hillary took only 30 days to fully recover from a concussion and blood clot which were sustained in a fall that was, in all likelihood, completely unrelated to getting crap-faced drunk. 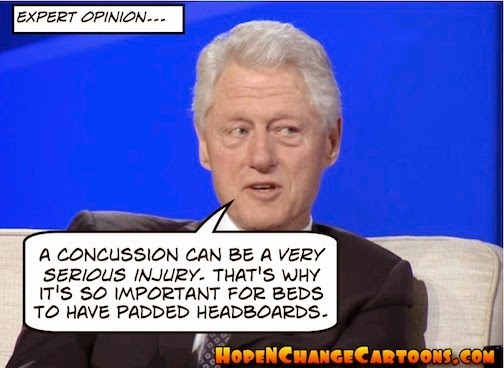 Moreover, Hillary's doctor said there was no neurological damage. But now, her alleged husband says that it took six months of hard work for Hillary to recover from her skull's collision with a hard object. "It was a terrible blow," said the former president, wishing he had a nickel for every time he had used the phrase as a critique to his wife. But in the words of Hillary Clinton herself, "at this point, what difference does it make?" Even prior to her accident, she was the only human on Earth who didn't know her husband was diddling Monica Lewinsky. She told Sir Edmund Hillary that she was named after him, even though she was born before he climbed Mount Everest. Following the (ahem) "suicide" of White House lawyer Vince Foster, she was unable to comprehend and follow a simple police order to keep her freaking hands off of his private files - ordering her lackeys to loot the dead man's office. And years later, she hallucinated snipers and gunfire when landing at an airport in Bosnia. So for once, Hope n' Change actually agrees with Hillary. What difference does it make whether she is or was brain damaged, insane, astoundingly incompetent, or all of the above? She needs to leave the political stage once and for all, perhaps to spend time being a doting grandmother to daughter Chelsea's baby. Incidentally, the baby's name, according to an informed source who used to be Secretary of State, will be "Rutabaga Rutabaga Rodham Rutabaga." Just when you think that liberal "journalists" can't grow any more biased or offensive, along comes someone like The Daily Beast's Eleanor Clift (who formerly helped edit Newsweek magazine into oblivion with a succession of cover articles praising Barack Obama's God-like perfection). Clift, while discussing Benghazi on a Sunday news talk program, angrily said "I would like to point out that Ambassador Stevens was not murdered. He died of smoke-inhalation in the safe room in that CIA installation!" That's right- Stevens wasn't murdered by anyone, he was simply a victim of bad ventilation! And you know the thousands of people who died in the World Trade Center? Presumably Clift believes that they weren't murdered by terrorists either - they all just happened to die of natural causes like fire, falling, and being inside collapsing buildings. Or maybe she'd like to argue that during the Holocaust, the death camp victims weren't murdered by anyone - they just happened to die because of cyanide gas inhalation. Clift's suggestion that no one was murdered in Benghazi (and by extension that there are no murderers to bring to justice) is appalling beyond belief. But astoundingly, she wasn't finished - she also insisted that the attack was a spontaneous demonstration in reaction to the infamous YouTube video, a preposterous whopper that even spokesliar Susan Rice dropped like a scalding potato almost two years ago. Sadly, Eleanor Clift's willful ignorance and sneering disregard for both life and facts are nothing unusual in what passes for journalism today - and people like her continue peddling propaganda and lies secure in the belief that the Obama administration makes it safe for them to do so. But remember, Eleanor, it was also this administration that assured Ambassador Stevens that he had a safe room.